Demon: A monster collection roguelike 3/31! And, boom! The new build is finally ready! * 19 new monsters, including 4 new starter monsters. These have been added entirely to the existing 17 floors to increase encounter variety and balance in ability type distribution. * 50 new abilities, and many changes to existing abilities. Many of these abilities touch previously underutilized elements, such as Fire, Ice, Electricity, Mind, Light, and Dark. * New mechanics, including: cantrips, staggering, capture failure penalties. * Significantly harder encounters, especially as you get further up the tower. * A new status condition of the Dark element, Hex, which lowers physical offense and defense significantly. * A variety of changes to various combat/progression formulas to bring the challenge level overall up to what I'm aiming for, and to balance out the various available strategies. Here is a collection of screenshots showing a rather brief run I had in the new build with an Ice/Dark summoner. I edited these into the first post too, the original ones I posted were pretty out of date, especially on art and UI. I hope this build proves challenging and fun, but it's definitely not for the faint of heart: Even I'm having a very, very low success rate these days. Still, if I can always trace the deaths to reasonable mistakes (which is the case so far), I'm okay with pretty much any death % shy of 100% Good luck everyone! Awesome, congrats on this next big release update! Thanks. Of course... it wouldn't be a big release update if a crasher bug hadn't managed to slip in. At least it was a relatively rare one, and even better, it's already fixed! The same links from before will now bring you to the 4/19 build, which fixes an annoying crash that would rarely happen while trying to capture demons in the presence of another demon with the Bolt Chain passive. This build might be a little mean. So far, the high score is only 2674, even among folks who had beaten the game in previous incarnations. That said, I do acknowledge this build is probably a little *too* mean... but not by a lot. If we were to call my goal for Demon's overall challenge level a 100, I would say that recent previous builds feel like they were in the 70-80 range, and this build feels like it is in the 105-110 range. It's off in the "too evil" direction rather than the "too easy", but the distance from the intended amount of challenge is less from before, so this is still progress. 4/26 is mostly balance tweaks intended to put Demon closer to its target challenge level including tweaks to how stats work, changes to item drop tables (especially on the lower floors of the Tower), and a few adjustments to specific demons, such as the dreaded Raicho. * F11 <toggle fullscreen> key usually doesn't work. This is the linux build. * Fonts are the game's least appealing element. Unlike the tiles (look awesome btw, esp. floor & wall) which resize well, whenever the the game's size is changed the fonts become pixelated and unattractive. I like playing 1920x1200 @ fullscreen. * Scriptable download link to most recent version, something I can but in a bash script to get the latest version iff one is available. Thanks for trying Demon out, and for the compliments and feedback. 193's not too bad for a start (sounds like the 2nd floor somewhere); plenty of people get 0 multiple times before they start putting any points on the board at all. #1: I haven't heard of F11 problems on other platforms, and I'm kind of in a weird place on Linux builds: I can make them, but I don't actually have a Linux box to test them on. (It wasn't until a few months back when koiwai volunteered to help me out that I even had a way to verify they ran at all!) That makes Linux-specific bugs a little tricky to address. That doesn't mean I'm not willing to try though. #2: The font is pretty old. I do plan to upgrade it in the future, but it's waiting in line behind the fun stuff (more levels, being able to choose between different relics (equivalent to races in DCSS), vaults, etc.) I agree it's a bit rough though. #3: Hmm.. what sort of link would you need for the bash scripts? Maybe I can kick Google Drive the right way and get a direct download link out of it if that's what you need? Apologies for requesting hand-holding on this more or less, but I'm pretty much a zero on Linux knowledge. Thanks again, and good luck on your future runs! #3: A static link (pointing to latest release) works but increases bandwidth (not sure if you care about this). Otherwise a link that includes the date or version number would work perfectly. Interface: I really miss DCSS's describe functionality: x for look (you already have this), = for select monster tile, and v for describe (as opposed to the mouseover or leftclick). IMO anything that reduces mouse<->keyboard switching. Spawning: Keep stairs well separated and/or monster spawn-sites well away from stairs. Once both L2->L3 (or L1->L2, not sure) where within five tiles of each other and surrounded by: 2xMalingee, 2xRaichoo, 2XWill-O'Wisp (I think) and possibly some other monsters. Well there definitely where more monsters after I experimentally evoked the stone of trouble (or something like that). Suffice to say I died quickly. Gameplay: Tedious and too much kiting/stair-hopping. Plus something fishy with monster positions. Fishy monster locations: Monsters often travel in pairs so I like using hypnotic gaze to separate them and deal with them one-at-a-time. 2] I freeze one, and when I return it has moved further than I can account for considering # of turns that have passed. 3] Monster position after leaving/re-entering LOS is unusual. 5] Better monster-hunting-for-player when player leaves LOS. I don't think this game considers noise at all, so stealth-characters are excluded. IIRC all out-of-LOS monsters drawn to some of my fights were within LOS of my summons. I'm not sure how faithful to SMT series you are trying to be (never played), so the above may not be applicable. Perhaps this happens at higher levels, but in DCSS when you summon menagerie, or forest, or hydra, or horrible things, there is a real sense of satisfaction. You know your opponents are in for one heck of an ***-kicking. Sorry, I hope this wasn't too harsh. You probably have a lot of "fun" features already planned that will flesh-out the game, so I don't mean to steal your thunder. This is still the most ingenious roguelike I've ever encountered. Oh yeah one more thing - a nice touch. I really like the ratholes within the walls (the blinking red eyes). First time I steered clear away from them. Oh, One last thing, this is important. Hunting the map for that last enemy to recruit/link can be dangerous: the map is big, there is no over-map to guide you (assuming you remember the position), and so I tend to mash the direction keys. Depending how dangerous the creature is, and because the UI lags behind the input/events just a little bit, I could accidentally blaze right past it and collect much damage, possibly even die (esp. ranged creatures). So I was thinking it would be nice if there was a version of O that keeps track of remaining previously-seen creatures and actively hunts them down (stopping when detected/in-LOS). #3: Hmm.. I can convince Google Drive to give me https://docs.google.com/uc?authuser=0&id=0B-sx_4eW-B5hXzJaWFN5ZXhLNkE&export=download that, but I'm not sure if it will keep working when I update later with a new version. Tedious, 1: The game's difficulty level was recently adjusted sharply upward. I think it's *close* to what I want, but it may still be running a little hot, which would account for feeling like kiting and stair-dancing are overly necessary. (I actually kind of loathe stair-dancing as a tactic myself, so I understand why it'd feel tedious if you felt the encounters were constantly nasty enough to force it.) I'm still collecting feedback from folks to see how close to "just right" I've got the encounter difficulty. If you continue playing, I would be curious to know if you feel like the need for these tactics diminishes as you get more runs under your belt. Tedious, 2: Managing your allies is definitely a major component of the game: as you go further up, you'll begin running into enemies with abilities that come at you from many different angles, requiring your party development strategy to adapt to match (at least that's the hope!) Choosing which demons/abilities to keep in your party as you advance is intended to be one of the main challenges. But, no, it isn't supposed to be everything. I felt like the biggest "risks" for Demon were getting the truly unique things: party management, recruitment mechanics, AI that could intelligently use any combination of abilities to the extent players would feel okay with trusting their permadeath lives to it (and find it a sufficient challenge to fight), and handling group-based combat, working. Most (almost all, really) of my early effort has been focused on those things, because if those didn't work, I feel like nothing else would help much. The good news is, I think I'm getting closer to the point where I have those things proven out enough that I can go back and begin to address the non-uniquely Demon elements (better terrain variance, environmental effects and interaction, such as you mentioned) that, when added to the uniquely Demon elements, should spice things up a fair bit. Expanding the AI further (both in terms of personalities and options for player control) is also on the schedule. But until then, to your point about truly impressive summonables: if you want something truly impressive to summon... well, there are Unique demons (first one can appear as early as T:3), and also randomly modified versions of demons, such as a "Fiery Zombie" (these also begin to show up, if very rarely, starting on T:3) These special demons are pretty hard to recruit even when you do encounter them, but they tend to be quite powerful within their weight class so to speak. Well-trained, they can become star players with little difficulty. You can also just make your own nasty demons by loading up normal ones with interesting ability combos. One of my favorite early combos is to teach Swiftness (Speeds up movement) to a Will O' Wisp. Will O' Wisps already have Ghost Pierce (an attack that also moves them through the target) and Evade Step (chance to Dodge on any turn movement occured), slapping Swiftness on them (available from multiple T:1/T:2 enemies) basically acts like perma-Haste. All that and you still have 5 other ability slots you can fill as it levels up. Oh, and never worry about coming across as "harsh", please. Especially when you're not. But, even if you were, it's fine. Demon's still fairly young for a roguelike. DCSS, ToME, and the other great old ones set a very high bar, if I'm going to reach those heights some day, I'm going to need honest feedback to get there, even if it is a little harsh sometimes. Thank you for typing all of this up, and I'm glad you're having fun. PS: The "auto-explore to known creatures" thing is an interesting idea... but critters move around all the time. Not sure how I could make this work without giving the tool knowledge the player wouldn't have. If it just went to where you last saw critters, chances are there would be no one home when you got there unless it was very recent. Hmm... maybe I could make "hunt X other monster" capture types give you map knowledge... or maybe cause it to attract enemies to you? :> I'll think on this and see if I come up with a happy solution. Boom, 975 on Lvl4(?). This is super addictive - definitely not tedious (what I said above, wrong connotation), but certainly repetitive. I probably could have sacrificed my entire arsenal against those charged pink raichoos and not survived. Honestly no idea what I should have done. P.S. Figured out the equivalent of DCSS' view (x,=,v), just hit entere . 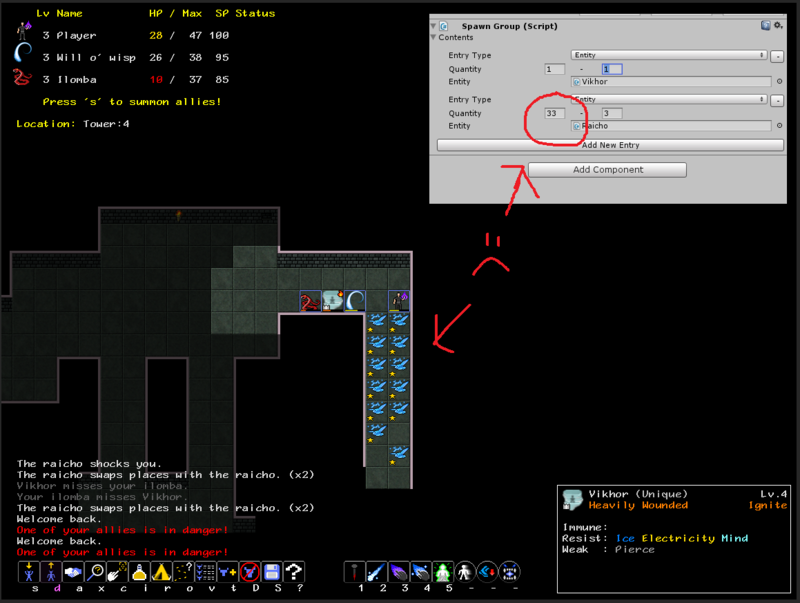 Regarding spawning: Just had a quite difficult encounter in T:3, the open floor layout. Band of zombies, zars, headless, (lab-coat-dude) at one set of stairs and a band of raichos, fishy-things, malingees and a gandayah at the other. I had to whittle the groups down, focusing on individual creatures and dancing between stairs. It was fun because - well certainly because it was survivable - but also because I had time to summon the correct creatures. Also the party layout mattered quit a bit, sending the faerie to the rear and the echeneis to the front, etc. I think the opponent constitution mattered greatly - for example malingees + riachos|huo-shu would have been much tougher than malingees+echeneis. But the real difference is that the stairs where far apart. 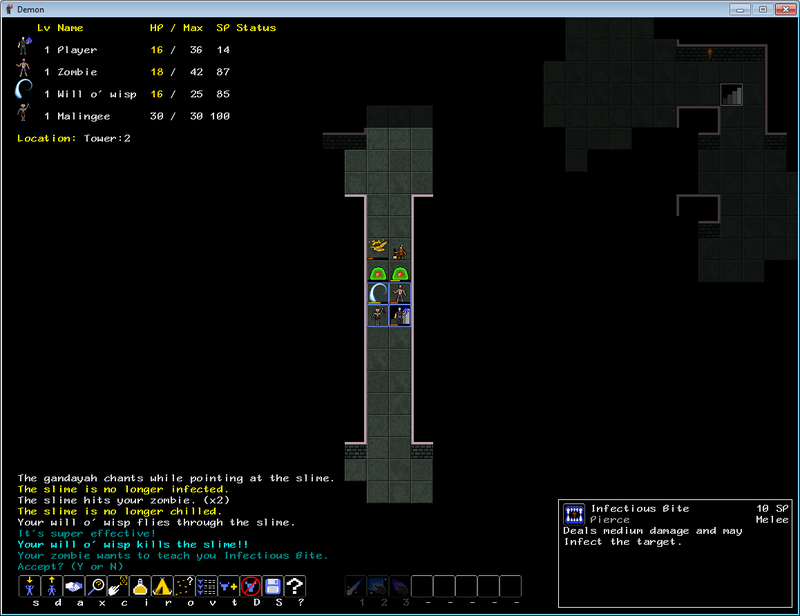 If in this case the stairs had been ~5 tiles apart, they would have been swarmed by ~15 creatures == not survivable. Is it really this simple? Its really weird that monsters have a "home" location and don't rove around (possible in a group, or perhaps disband once disturbed). Possibly the fish I was luring decided to return to "base", while we were both moving towards this "base" it was constantly 1-2 tiles out of my LOS? My point is these behaviours don't seem complex enough. Perhaps the fish should, once having lost sight of its prey: make a deduction towards the direction, search for a bit, loose interest, return to its friends. Or perhaps fish, being group creatures, should be unwilling to even separate. And the returning to home notion doesn't make sense for all creatures. Regarding the first two points, I'm aware that Hypnotic Gaze has a very variable duration, however across multiple casts across multiple games I've never been able to freeze the second slime to lure away the first. Zap, lure away 10+ tiles, return 1 tile and see second slime enter LOS. Regarding management, I can suggest two more pressing tweaks. First, its impossible to distinguish friend/foe between certain monsters of the same type (happens most often with slimes and echeneis). Same goes for the difference between unique demons and unique heroes: one is recruitable, the other not. So the only way to tell them apart is to attempt a link? heh, really good point ==> AI that could intelligently use any combination of abilities to the extent players would feel okay with trusting their permadeath lives to it ... Right now, if I give a monster an unusual ability (or a support ability that's not meant to be used often), I just assume (well maybe some finger-crossing & praying, in passing) that the AI will handle the new skills appropriately in combat. So far have no reason to be disappointed. Regarding combos, I also like Ghost Pierce on Echeneis. Actually I had some really interesting echeneis combos which I've now forgetten. Super-low priority, but I guess that would be a good reason to implement a high-scores viewer (similar to DCSS). Its not that I want "impressive" or "powerful" summonables, its that I feel all the different combos don't differentiate the monsters very much. Probably because I haven't played enough to notice the nuances of the combat, but for the most part the additional abilities don't add anything new. X% stronger, Y% faster, Z movement during attack, etc... these all seem like slight enhancements to existing traits or slightly modifications to the attack, etc. The monster doesn't seem to "evolve", ie once an echeneis, always an echeneis. The initial traits/resistances still seem to matter much more than the individual abilities. Well, so far... I was just completely massacred on L4. I don't think any choice of summons/party/resistances could have kept me alive. Anway, I'm pretty sure I don't know enough about the training system to make good upgrade choices. Regarding "auto-explore to known creature" I wouldn't mind regular auto-explore-until-stumble-across-known-monster. The monsters don't seem to move much once out of LOS. Regarding the harder difficulty you mentioned, you should also consider play-time as well as high-score. Does the game last long enough to make use of the deep mechanics? I'm much more likely to play this than DCSS right now. For example, I won't start a DCSS game until I have an entire weekend free. This game certainly isn't a coffee-break roguelike, but I don't survive much beyond 1-3(unusual, max) hours. But I'm a bad metric - I'm new, and my play times + scores are constantly increasing. Modified Raicho packs are probably the deadliest encounter in the early game. Base Raicho have fairly crappy Magic power, limiting the damage they do (though with x1.3 Speed, high accuracy, and a high chance to Shock, they still pose a major threat.) But if they get modified, it tends to be a Magic-boosting modifier, which makes them a whole other color of bad even before considering what new abilities/resistances the modifier granted them. I'm probably going to have to nerf them a little (or maybe make their capture type a flee capture instead of a kill capture so you can 'dismiss' one immediately as a desperation move by feigning a link.) I wouldn't mind a late game monster being that nasty, but Raicho live on T:2+, which is a little early for something behaving as overall nasty as they are: a couple of people have told me they have nightmares about them. The encounter you described w/ the zombies, zars, headless, and West is the sort of encounters I'm aiming for in general. Not all of them should or will be that intense, but I definitely think it's when the gameplay is at its strongest. I'm very happy you felt that sending in the correct creatures was important: an earlier feedback item I got that the difficulty increase was meant to address was that it largely didn't matter what you sent in. I felt like I had corrected this based on my own play experiences, but it means much more hearing it from others. 1a) If a monster can see enemies and has offensive abilities, it wants to move towards/fight with them. 1b) If a monster can see enemies and doesn't have offensive abilities *and* can see allies who do have offensive abilities, it stays close to those allies, ready to use its (presumably) support abilities. You can see this behavior with Faeries/Gandayah: if alone, they behave like most creatures do, but in groups with actual "fighters", they tend to hang back and support, even if it means they're just passing some turns with nothing to do yet. 2) If it can't see any enemies, but an ally it can see can see enemies, it moves towards the ally. 4) If it has no idea where enemies are but has a leader, it moves towards the leader. 5) If it is a leader, it tries to rejoin with its subordinates if needed, otherwise it wanders around the level. So, it's not as simple as you feared. But, it isn't a noise system either. The behavior you describe sounds like something that could happen if the priority order got mixed up somewhere (i.e. : the fish chasing you decides following its left-behind leader is more important than chasing where it last saw you) I'll take a look at the code for this once I finish my current task and see if anything is wonky. That still doesn't explain the slime example though... I'll keep an eye out for that, and play Mind in my test runs for a bit to see if I can repro it that way. Funny thing about the ability-using AI: the best feedback to get about it is usually no feedback at all. If it works so well as to be invisible, that's usually a really good sign! I'm glad it hasn't let you down. In the past, beating the current content (17 floors) usually takes about 4-6 hours in a single run, but I don't have a whole lot of data on that, particularly after the difficulty increase. Funny that you've mentioned high scores though: the very next build I'm working on is an attempt at tracking and displaying high scores via a server. I'm glad you're getting noticeably better as you play, I do get feedback sometimes that people sort of get mired in the T:1-T:2 range and never seem to break out, and that worries me... but then, I've known people that that happens to in other roguelikes (DCSS among them) too. There are definitely players who love and play roguelikes and never beat them (I was in that camp myself for over a year with DCSS, and half my life with Angband) or even get very good at them, so I suppose that is normal or even expected to some degree, but it still bothers me when it comes to Demon. Thanks again for all the awesome feedback. Cheers! High score of 2579 yesterday playing buff/debuff, and no raicho packs. Previous game (same character build) had an encounter with a deadly pack T:3 or T:4 - I'm not sure which, the levels need to be marked better - that I couldn't avoid. Five regular riacho + 1 modified raicho (absorb max hp). Thanks to haste I could avoid but not outrun them, and the modified riacho seemed able to both keep up and cast that absorb-max-hp spell. Since I couldn't find the stairs (no minimap, *hint* *hint* ) that riacho finally wittled my health down to near zero and I accidently ran towards another after recasting haste (j vs k), which killed me instantly. Mentioning the vi-keys by the way, thanks for implementing those. 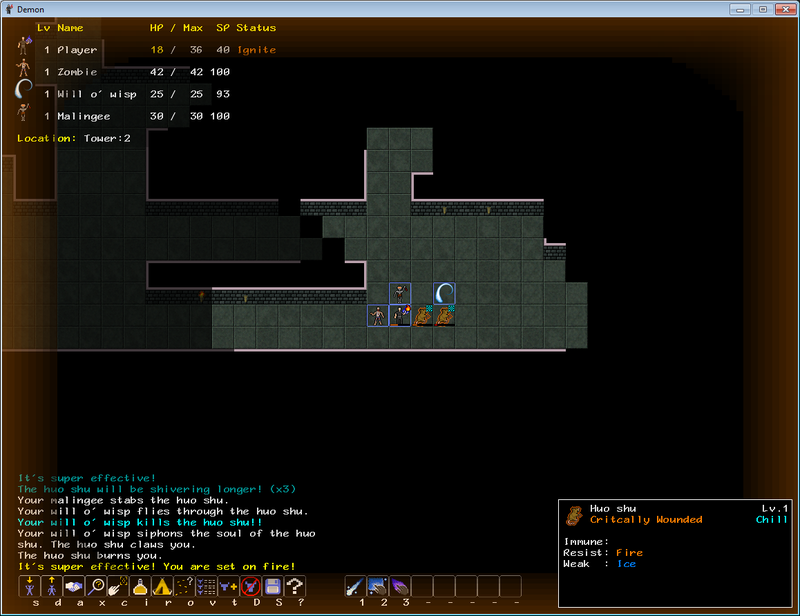 Some roguelike only provide arrows which are OK aside the lack of diagonals, and numpad layouts. I know some people swear by the numpad but I find it actively discomforting - moving the middle/ring/3 finger up/down between 8/2 is almost painful. And then they recommend remapping keys (ToME4, I'm pointing at you) - how am I supposed to remap keys if I don't know the game, which keys are important or related and should be kept, kept together, or discarded. Believe it or not, thats the main reason I never "got into" ToME4. Tangent aside, I also think riachos should be nerfed, but perhaps not in power? A single riacho isn't too deadly, and in my high-score run I did actually encounter three vile raichos (not a "pack") supporting Vikor and some other creatures. They werent too bad because they had a tendency to hang back to cast envenom (I think), there were only three, and this was a higher level, but they forced me to kill Vikor instead of recruiting him, grr. Anyway I suggest reducing the likelihood of large roving raicho gangs at lower levels, or perhaps giving them herd mentality in which the entire flock flees if they've taken too much damage, or perhaps having damage reduce their speed multiplier? Regarding summoning the correct party in the correct order: at higher levels I'm not sure this matters as much. I didn't die, but actually quit my 2579-score run since my character was in a deadlock. I simply didn't have enough allies to handle Ludoc the Summoner and as he would recall any near-death summons I couldn't kill any. By the way, his summons seem to heal faster than mine - I recall nearly defeating that giant juggernaut creature, having it recalled, fighting some other summoned creatures incuding eventually that very same giant creature. Anyway I started trolling the next higher level for recruits but couldn't do better than break even. For every new recruit, on average I'd loose a previous ally... so eventually I just quit. * Monsters don't loiter around, waiting if you'll show up and perhaps carrying out a limited search in the area they've last seen you (doesn't need to be as sophisticated as a noise system). You double back and it seems they've vanished. * Nearly all monsters return to home base (Ludoc the summoner is a notable exception, among others). So a 15+ pack chases me from the top-right corner of the map to the center and then disappears. When I go searching for them, they've all returned to the top-right corner of the map. WTF!! 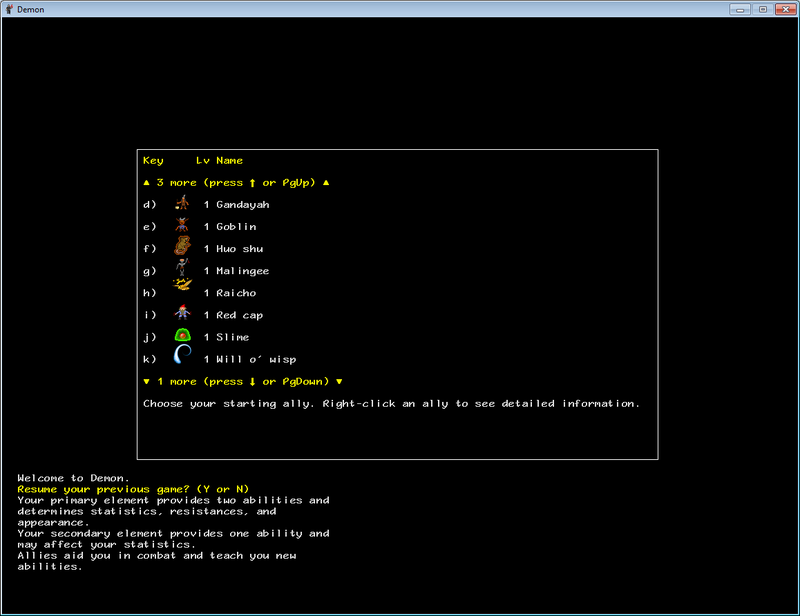 I actually like this "return to base" behaviour, no other roguelike I've played has it, but only in small quantities. Not every monster/pack should be predisposed to this. * Monster's don't disperse. 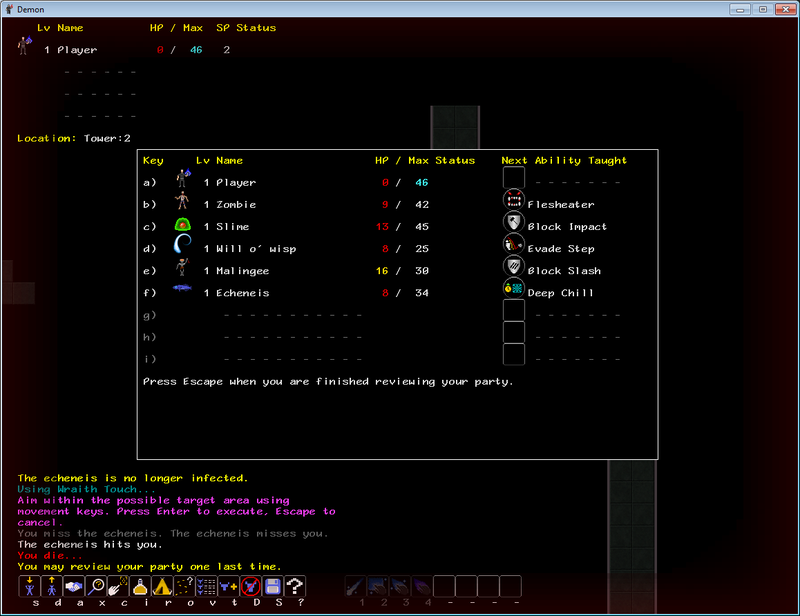 For example, when disturbing a mixed orc/gnoll party in the lower DCSS levels, the gnolls generally stick together as a party (they do move "camp" however) while the orcs actively search me out individually. I find it suprising that a mixed 15+ party of various groups manages (faerie+asrai, absorb-health-snake+lilith, I-forget+I-forget) manages to chase me from halfway around the map and remaing a cohesive bunch. These problems are slightly exacerbated by Demon's lack of an evasion (stealth, invisibility, ...) system. You were right about my improving tactics. Now that I know the game more I don't feel the need to kite or stair-dance as much, especially not on the lower levels. But against a pack of 15+ creatures that won't disband!!! The game doesn't provide enough mechanics to separate these creatures. My current tactic to cull such herds is to haste both myself and a target until we are out-of-LOS of the pack, then totally annihilate him 1-2 turns. So I looked and really (still) don't see this supposed blue box around allies , not even a little bit. 1. stairs and party positioning: Stairs totally disrupt party positioning, for example I've had a malingee/gandayah climb the stairs right in front of me, and come face to face with some monsters, while my riacho appears two tiles behind me. The gandayah is my support creature and though they can give as good as they get in combat for a little while, the riacho - my attack ally - makes to move to swap places with the gandayah (at least not until the gandayah is several damaged). 2. projectiles: do allies attempt to protect me from missles and projectiles? I'm not sure if they do, or its just random movement in front of me while advancing on some enemies. If they don't I wish they would (at least some), and if the do I wish they would do it faster. 3. I've had one case where a specially trained raicho moved to the back of the pack when severaly injured. I've decided to flee, and since we're in a two-tile wide hallway with my other two summons defending the raicho, I decide to flee rather than waste a turn dismissing the raicho. However in the course of two turns, while fleeing, this happened: A heavily damaged enemy retreated, leaving an open gap in the hallway. The injured raicho, instead of holding ground, decided to advance to that empty tile. It died the next turn. This only happened once, and I don't remember of projectile-casting monsters were involved. Did it move into the gap to protect me from a projectile? If so I wish it would've recognized that I was fleeing (it should flee too) and my health was decent enough to absorb a few hits. Regarding gandayas and unlike fairies (the other support creature), I've never encounted any modified or higher-level gandayas to recruit. This is a serious bummer, my gandaya is completely outclassed mid-game. I mean, it levels up but not enough to support my greater SP needs. At first I was upset to lose my starting raicho on T:5 to a hero. But in the previous level I had recruited a modified raicho that was higher level (better stats) and for the most part had better traits (some traits lower, but sum of trait points > starting-raicho-trait-points-sum). True I lost *some* abilities, but the new raicho had an equal mount of different, equally useful abilities. I don't think the game provides enough incentive towards ally levelling and training - newer monsters have better stats/traits and training is too slow (has to be, because it is tied to levelling) to make a difference, or to make you care enough about your trained creatures. Because of the limit on number of allies, because you are always recruiting newer and higher-level monsters, and because of the limit on trainable skills, very often I can't construct and train the creatures I envision. Aside from abilities, all the creatures are *exactly* the same. In fact, given enough training points, I could recruit a higher level creature X and retrain it to be exactly identical (but more powerful) than creature Y. The only notable exception are high-speed creatures (raicho and those vitality-snakes), because they are rarer. Of course there a some limitations - don't train a low-strength ally in body attacks etc, but generally higher level creatures will have all-around better stat/traits. As I also suggested mentioned, there arent enough *tactical* spells. For example, a wizard's starting spells lead to a very thoughtful playstyle, rather than bash&slam (melee DCSS) or in the case of Demon, sumon&sumon&sumon. I'm specifically referring to blink, slow, conjure flame, and mephitic cloud. Foremost, DCSS's mephitic cloud (confuse) is miles better than Demon's panic, in effectiveness. Later spells include many of the *cloud spells which can be used to control the battlefied, prevent effect (ranged fire vs freezing cloud) or slowly whittle away enemies. Spellforged servitor is a another example of a summon well-adapted to Demon. I don't mean as a summon that mirror's your personal skills (though that might actuall be a good suggestions, a "shapeshifter" monster for Demon whose abilities are drawn from the creatures near it), but as a creature whose arsenal (Demon abilities) are constructed and used to great effect (orbs & clouds), more so than is possible with training in Demon. Snakes (to Stick) provide another perfect example of a characteristic that should be linked to physical appearance and not abilities. Only creatures with tentacle-like appendages (octopodes, snakes, etc) should be able to constrict. This shouldn't be an ability, but a secondary characteristic that randomly triggers during combat, just as in DCSS. Summon butterflies is another perfect example of a tactical summon. Unlike "packs" in Demon consisting of a multiple allied creatures (ie, Fae+Asrai), some packs should be a single creature, just as crawl's Monstrous Menagerie, Summon Horrible Things, Sumon Greater Demon (some demons are summoners), Summon Forest (not very useful but utterly cool, gives DCSS much more "character"), and even Summon Butterflies. Summon butterflies is a spell that sacrifices quality (power) for quantity. In extremely rare circumstances this can actually be useful. Theoretically only, I've never bothered with this particular multi-monster spell. However the idea is that in some situations, quantity matters more than quality. As long as a single creature remains standing, healing it will restore the "pack" to the original count. 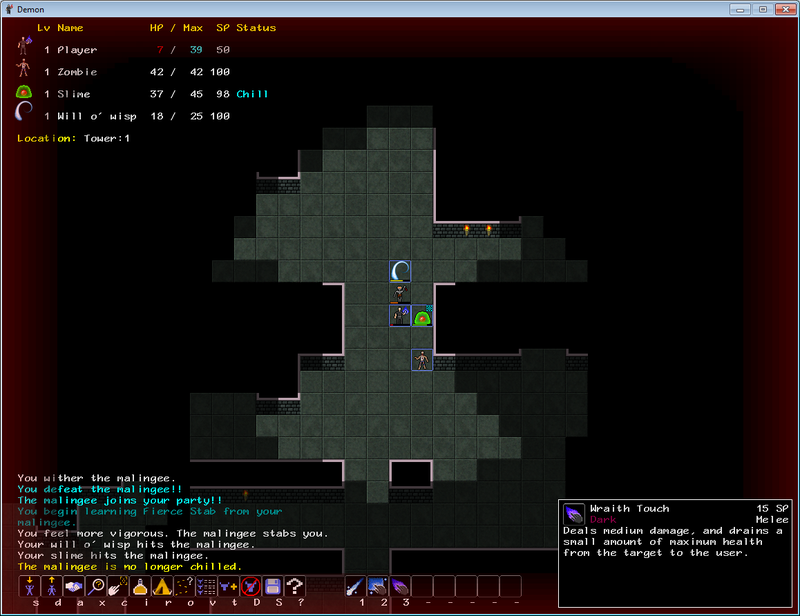 Perhaps this ability is available at higher levels, but some demons in DCSS summon other, weaker demons. For example ynoxinul summons ufetubus. I believe this would make an interesting ability when applied to Demon. Difficult to balance, however, but I'm tired of *always* feeling outnumbered. Part of the joy of Summoning in DCSS is standing back while your army rips into your opponents. As it stands now (at least up to level 7) Demon has nice difficulty progression. I always feel like each fight will be my last. There are always either more or more powerful opponents, and while each fight is difficult very few (packs of only modified raichos) are impossible. That said, I think the game could use some spacing. For example, even deeper levels in crawl have a few easier opponents. Goblins breed like hamsters, apparently. So you have the satisfaction of easily defeating them, as well a meter for progress. After defeating previous monster X in Y time, you know you are Z% better. I also think there should be a low rate of dynamic spawning to a] keep things interesting b] recruit lower-level but helpful monsters that have since died from you inventory. For example, I've not met any gandayahs in the higher levels, so if I lose my last, that's it for gandayas. Also, its a pain to recruit monsters from higher levels: it would be nice to return to lower levels and recruit enough monsters to fill the remaining slots just as cannon fodder. Regarding returning to lower levels, crawl makes even previously visited levels interested. I'm not referring only to the different regions (shoals, depths, abyss, hell, etc) but also the different features. For example, shops provide a good reason to revisit old levels. Demon's old levels are depressing. They're empty and depressing and make you think how much time you put in the game and how likely you are to die around the next corner [...upon return to higher levels]. I know its a lot, but I hope you get an idea of how awesome I think your game is. I'm picky even with popular games like ToME.